I’ve been beyond busy with life and work recently and just haven’t had the time or energy to reflect on the historic March 2, 2012 Henryville, Indiana tornado day. Finally, push came to shove and I’m pretty much forcing myself to write this post before too much time has passed. Plus this blog needs some attention from yours truly. As luck would have it I had the opportunity to chase with my good friend and long time chase partner Simon Brewer. I had not chased with him or our other Stormgasm original Tom Santillo since (ironically) last March! It was really nice to catch up with him. But not only that, it was great being able to focus on shooting steady, quality video when it mattered (that isn’t normally possible when you chase solo or with a non-veteran chaser). We both knew the conditions on this day would simply be outstanding for violent tornadoes, and I knew if things came together just right it would likely be a historic day (of course we chasers say that more times than not, but usually something makes the setup less than perfect). As you can see from the photos, things came together just right this time. 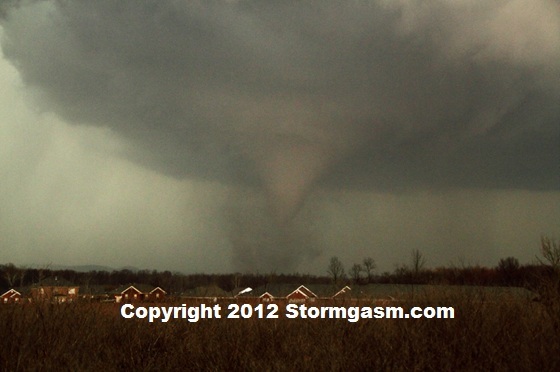 Below is a clip of the video I shot of the Henryville, Indiana tornado. This is in a much lower quality than the original video which was recorded in HD, and of course the original video is much longer in duration. We saw the first storms form in southwestern Illinois which quickly became supercells. At that time we were in east central Indiana expecting to either intercept the ‘main’ cell, or a new cell that might form out ahead of it somewhere in south central Indiana. A new cell did form ahead of the main cell and when it took over and became the dominant cell, I knew it was going to produce a violent (and likely deadly) tornado. I knew this because of the incredible CAPE and shear environment the supercell was moving towards. A tornado (likely violent) was nearly a guarantee given all the conditions that were present. When I came to that realization -quite honestly- I felt sick to my stomach. It was while we were sitting at the Henryville, Indiana exit off I-65 looking at the latest radar image. We didn’t have much time to make a decision since the supercell was moving northeast so quickly. We were trying to decide where to sit and wait for the storm to come into view (at the time we were thinking we’d probably see a big, violent tornado tornado emerge). I can’t remember exactly when we received confirmation from the storm reports/tornado warning that a tornado was actually on the ground from this storm (we couldn’t see a thing yet from our vantage point). I do remember seeing the radar image, which featured a debris ball and a maxed out SRV signature (means a BIG tornado is very likely on the ground). That’s about the time when I realized people were in a lot of danger – for their own lives. When violent tornadoes move rapidly through hilly terrain it becomes an extremely dangerous situation, life threatening situation. We ended up deciding to head down to the next exit, south of Henryville. We parked the car at a truck stop that was situated at the top of a small hill, which offered the only vantage point in the area. I stood on the edge of the woods on mud, brush, broken tree branches and all, trying to get a view of the storm. 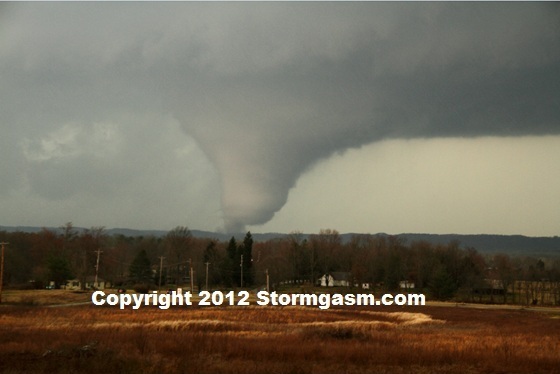 Within a couple minutes the tornado was in our view, some 20 miles to our southwest! This tornado ended up being in our view for several minutes, and is one of the most photogenic and intense tornadoes I’ve ever seen. After the tornado crossed I-65 another supercell was approaching from the southwest. The tornado that storm produced was rain-wrapped. Luckily it did not pass directly over our location, but the storm did drop large hail. 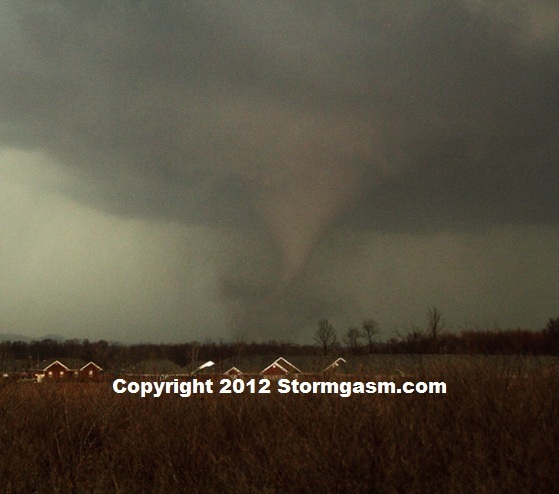 Henryville, Indiana tornado on March 2, 2012 as it transitions from a cone shape into an elephant trunk shape. 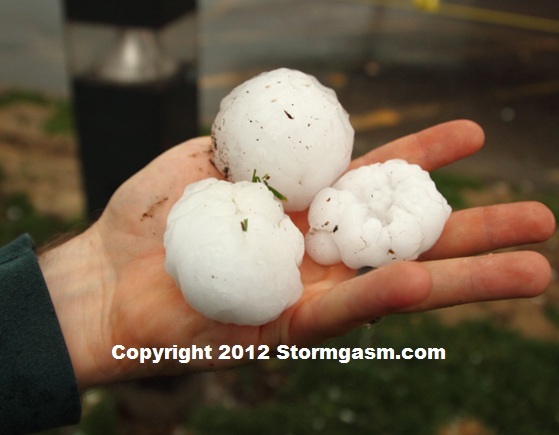 Golfball to baseball sized hail from the storm which followed the Henryville tornado. Asphalt that had been scoured from state highway 135 north of Palmyra, Indiana. 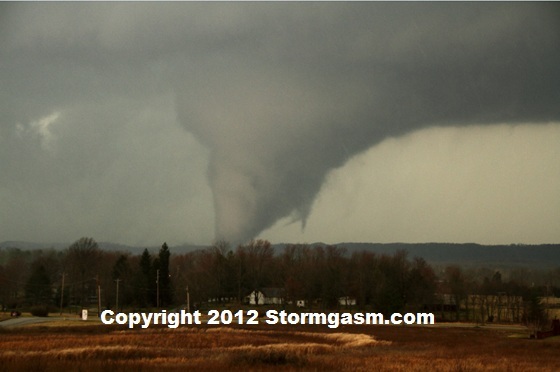 The main tornado (seen in all the photos posted) which hit Henryville, Indiana was rated EF4. It caused such extensive damage that all roads except I-65 south were blocked from debris. We actually sat at the same exit from which we viewed the tornado for over 30 minutes trying to figure out how to get home! Finally, we decided to go south on I-65 and loop around the northwest side of Louisville. In doing so we ended up driving north on state highway 135 north of Palmyra. 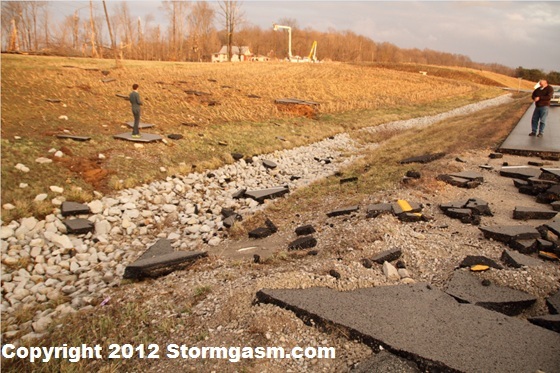 That’s where we inevitably ran into the damage path from the early stages of the Henryville tornado. The tornado had managed to scour massive chunks of asphalt from the road and toss them tens of meters into a field!